The week after Easter was only a short week, but seems to have continued very busy. 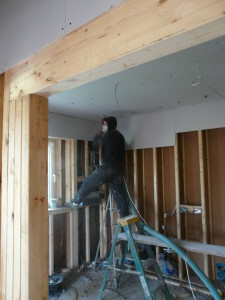 Tacking—putting up plasterboard—got underway. The intention is to tack the downstairs ceilings first. 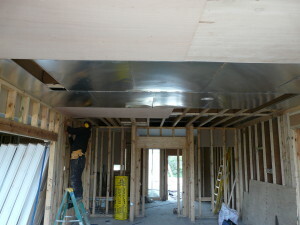 This will allow the Warmcel 500 to be blown into the ceiling voids—and then the ceilings can be plastered. It makes sense to plaster the ceilings before we tile the ground floor because of the risk of damage to the tiles from the scaffold tower. Also, you get a neater finish if the tiling is completed before the walls are tacked or the door frames installed. 8 pallets of Warmcel arrived. Each bale weighs 13kg, there are 40 bales to a pallet—and this is only a small proportion of the total that will be blown in. In the meantime we’ve moved the doors out of the house to paint them—at least in primer and undercoat. 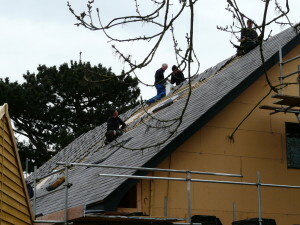 The roof is finished and looks very fine, with all 6 rooflights in and both the solar thermal and PV panels fitting in as well as can be expected. We were keen to have panels which did not have light coloured edging. As reported earlier the Solar PV is complete and up and running. Although this happened and was registered before 1st April, I failed to get the Feed In Tariff Application in before this date. The rules changed on 1st April, so before the application can be accepted an Energy Performance Certificate must be provided. The Predicted Energy Assessment will not do. (The PEA Energy Efficiency Rating came out at 98.) It will not be possible to provide the EPC until all the doors and windows have been fitted, the insulation installed and an air test performed. This will be a few weeks yet. In the meantime, the electricity supplier is doing very nicely—well over 300kWh generated already almost all of which is going into the grid! I’m hoping this will be backdated to the application date—but you know what? I doubt it. In the last post I said next week for the three big south windows. But a strong workforce needs to be assembled for this work as they are very heavy and there were some doubts whether they could be got into position while the scaffolding is still there. The thermal store has been filled—1000 litres (= 1 metric tonne!) and the solar thermal system brought into operation. When the sun comes out, the system compares the temperature of the panels with the temperature in the thermal store. If the panels are hotter than the store, the (low energy) pump starts. As there’s no one using heat or hot water in the house there’s a risk that temperatures could get too high. If the thermal store gets above 70C the under floor heating will turn on and heat will be dumped into it. This will help to dry the house out. It feels pretty dry already, but with space where some windows will be and the massive slab of concrete on which the whole house rests, there must be a good deal of water to be removed yet. Energain® installation. All of the downstairs bedroom ceiling has been lined with this – under the plasterboard – a further 11 m2in the sitting room and little bit left over has been put at the front of the bathroom. Now it is not my job to advertise Energain, but we needed more thermal mass in the house and this product, which Touchwood Homes told me about, seems a good way forward. In essence, it uses the latent heat of fusion of a wax to provide thermal mass operating in the range 18 to 24C (if you want to know more, it’s easily found by internet search.) It’s not cheap – but probably less expensive than building a 50mm block wall on the inside of the rooms or putting a concrete slab in the ceiling. 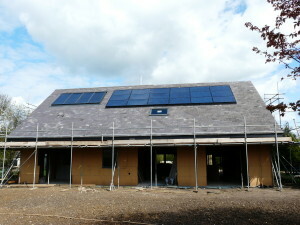 This entry was posted in Foundations, Ground Floor, Solar PV, Solar thermal, Thermal mass, Underfloor heating, Windows. Bookmark the permalink.